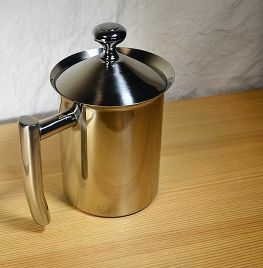 A sturdy, yet elegant Milk Frother. Create frothy milk for cappucinos and lattes with the Café Ole Milk Frothing Jug. Made from stainless steel with a plastic milk frothing mesh on a plunger - you use a simple pumping action to prepare the frothy milk. With removable lid. You can heat the milk directly on a hob (not induction hob).